That next major step came this past weekend in nearby Pitman, New Jersey. As players began filtering in during the morning, they were greeted by the sight of most of the team’s front office. Among the people on hand were majority owner Ron Jaworski, head coach Clint Dolezel and assistant coach and general manager Phil Bogle. For Bogle, last season is just that; last season. He stressed the importance of finding diamonds in the rough at each open tryout the team sets up. Dolezel stressed the importance of avoiding complacency, a trap that often hits championship teams across all sports. He mentioned that bringing in newcomers is always a great way to force the seasoned members of the team to step up their game. Dolezel also mentioned that Jaworski and other owners of the team have always set sustained success as the eventual goal of the Soul organization. “We have ownership that holds us to high standards, and we hold ourselves to high standards as a coaching staff and we’re all about winning around here, and there’s never enough winning,” Dolezel said. Two people in attendance of the open tryout were Bob and Charlene Blittersdorf, Soul fans since 2007. They were impossible to miss, both showing off James Romain jerseys. For the Blittersdorf’s, this isn’t just another team. They both said that the players and fellow fans have almost become like a second family to them. 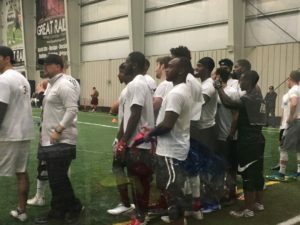 In 2016, when Philadelphia beat the Arizona Rattlers in Arizona for the championship, the two went to the game and even stayed in the same hotel as the players. 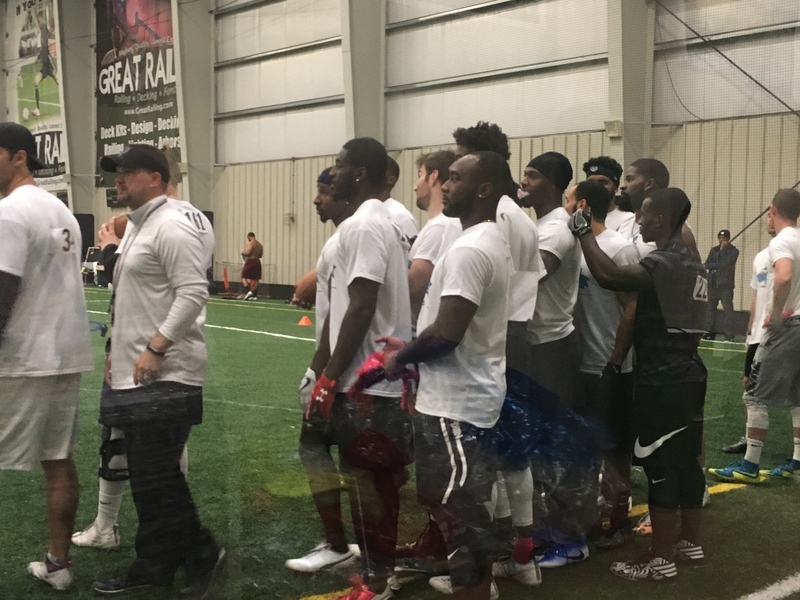 But last weekend, they were just there to check out some of the new recruits and see how the tryout would turn up. Looking ahead to the new season kicking off in May, Bob Blittersdorf said the expectation from the fanbase for 2018 is simple: keep doing what they’ve been doing. As the tryout got underway, it was explicitly clear that the front office wasn’t fooling around. The first two drills were a three-cone shuttle to test agility and a 40-yard dash to test speed. If attendees didn’t hit a certain benchmark determined by the coaching staff, they were dismissed. As the tryouts moved on, the cycle repeated, each time leaving a dwindling number of participants. Miss a couple of receptions in a row? See you later. Let your man blow by you in a pass protection drill? Thanks for coming, better luck next time. Consistently overthrow your receiver or get left in the dust by your matchup? Hasta la vista. Some would call it cruel, but the reality of the situation is this: participants weren’t ever going to be handed anything. It doesn’t matter if the field is 100 yards long or 50 yards. Football is a merit-based sport that only hands you as many opportunities as you earn. If you don’t show an effort, people won’t keep giving you chances. About 40 attendees remained at the end of this pressure-cooker situation. One of the last standing was Nick Lamb. Lamb attended Muhlenberg College, graduating in 2017 with a couple of school records to his name. Perhaps most notably is the fact that he did such without a full four-year ride under his belt, playing football his junior and senior year, plus a year of grad school eligibility. Explaining the feeling of surviving all the way to the end, Lamb had only few words to describe the process. Reflecting back on the whole process, Lamb said that he was thankful for the chance to come out and showcase his skills. “It’s a great opportunity for small D-III school guys like myself to come out and showcase our talents, ’cause we don’t really get too many opportunities after it’s over. Not a lot of us get recruited, so it’s a good opportunity for guys like that to come out,” he said. While the end results of the most recent tryout have yet to be revealed, one thing’s for certain. As long as the Philadelphia Soul continue to hold these events, it seems as if there will always be people willing to throw their hat in the ring. For questions/comments about this story, email sports@thewhitonline.com or tweet @thewhitonline.